This drawing illustrates the gradual development of the English Bible as well as the foundations upon which each successive version rests. It is hard for us to realize that when the books of the Bible were originally written, there was no printing press to multiply the copies. Each copy was made slowly and laboriously by hand. Under these conditions it was inevitable that many ancient books should be lost. This largely accounts for the fact that all the original manuscripts of the Bible have been lost or destroyed. The question, then, must be asked, what do we have as the literary foundation of our Bible? a. Codex Sinaiticus, originally a codes of the Greek Bible belonging to the Fourth Century. It was purchased from the Soviet Republic of Russia in 1933 by Great Britain and is now in the British Museum. b. Codex Alexandrinus, Probably written in the Fifth Century, no in the British Museum. It contains the entire Greek Bible with the exception of forty lost pages. c. Codex Vaticanus, in the Vatican library at Rome. It originally contained the whole Bible but part are now lost. It was written about the Fourth Century. a. Septuagint Version. The translation of the Old Testament Hebrew Scriptures into Greek made at Alexandria in about 285 B.C. b. Samaritan Pentateuch. Strictly speaking, this is not a version but a Hebrew text written and preserved in Samaritan characters. c. Pashito or Syriac. The whole Bible written possiblely in the First or Second Century. Most likely this was a translation into the common language of certain parts of Syria. d. Vulgate. The entire Bible translated into Latin by Jerome of Bethlehem. It was completed about 400 A.D. This was that standard Bible in the Catholic Church for a thousand years. During the Dark Ages very little Bible translation was done. There were a few minor translations made of portions of the Bible. The Word of God was locked up in the Latin language, which was unknown to the common people. 1320–1384. John Wycliffe, a great English scholar and Bible student, conceived the plan of translating the whole Bible into common English. He translated the New Testament in about 1380. It is not known how much more work he did before his death. The work was completed by his friends after his death. This work rests heavily on the Latin Vulgate. William Tyndale was the next in order of the great English Translators. He was an early and courageous reformer and was determined that the English common people should have the Bible in their own language. Persecution made it impossible for him to do his work in England, so he crossed over to the Continent where his New Testament translation was issued in 1525 and the Pentateuch in 1530. His translation does not rest on the Latin Vulgate as much as Wycliffe’s. Tyndale was a Greek scholar and had access to the Greek text of Erasmus and other helps that Wycliffe did not have. In addition, he had a fine command of the English language, which left its impression on all later versions. He was martyred before he completed the Old Testament, but it is generally believed that he left the material that later appeared in the Matthew’s Version. Miles Coverdale. Coverdale was a friend of Tyndale. He prepared and published a Bible dedicated to King Henry VIII in 1535. 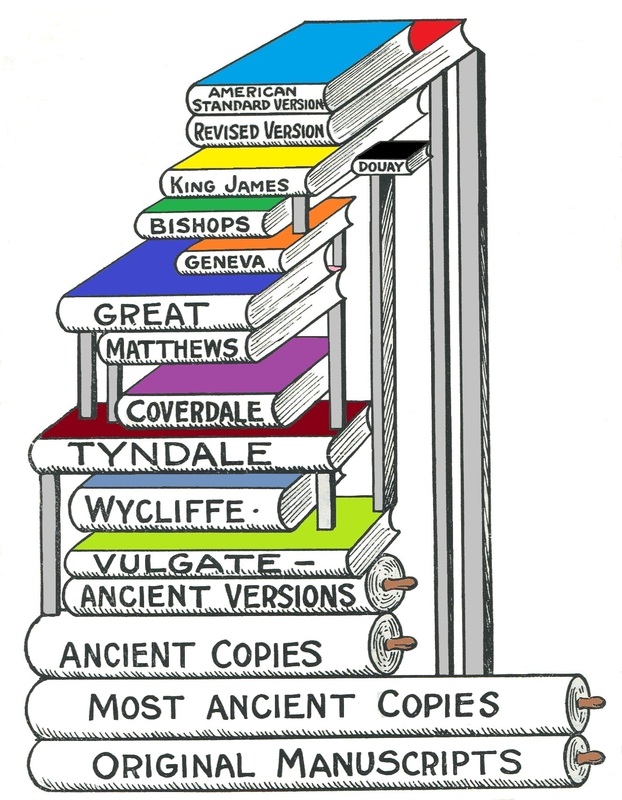 Coverdale’s New Testament is largely based on Tyndale’s. He used the Latin and other versions as helps, as well as Tyndale’s. Matthews’ Bible, 1537. At about the same time as the second edition of the Coverdale Bible, another translation appeared. Its authorship is uncertain, but although it bears the name of Matthews it is generally credited to John Rogers, a friend and companion of Tyndale. It is thought that this scholarly man came into possession of Tyndale’s unpublished translation of the historical books of the Bible. It contains Tyndale’s translations in their latest forms but also gives some evidence of Coverdale’s work. The Great Bible. 1539. This translation is based on the Matthews, Coverdale and Tyndale Bibles. The first edition was prepared by Miles Coverdale and was ordered to be set up in every parish church. It was a large-sized book that was chained to the reading desk in the churches, where the people would come to hear the reading of the Word of God. The Geneva Bible. 1560. This translation was made at Geneva by scholars who fled from England during the persecution by Queen Mary. It was a revision of the Great Bible collated with other English translations. This was a very scholarly version printed in a handy size and for many years was a popular Bible in England. The Bishop’s Bible. 1568. It was prepared under the direction of the Archbishop of Canterbury during the reign of Queen Elizabeth. It is manly a revision of the Great Bible although it is somewhat dependent upon the Geneva Version. It was used mostly by the clergy and was not popular with the common people. The Douay Bible. This is a Roman Catholic version made from the Latin Vulgate. The New Testament was published in Rheims in 1585 and the Old Testament at Douay, 1609–10. It contains notes that are controversial and it is the generally accepted English Version of The Roman Church. The King James or Authorized Version. 1611. This version was made by a committee of forty-seven scholars under the authorization of King James I of England. The Bishop’s Bible was the basis of this new version, but the Hebrew and Greek texts were studied and other English translations consulted with the view of obtaining the best results. It has held first place throughout the English-speaking world for over 400 years. It went through two revisions: 1769 and 1850. The Revised Version. 1881–1884. Made by a committee of English and American scholars. While it was supposed to be another revision of the Authorized Version, it goes beyond that as it reaches down to the most ancient of copies of the original Scriptures that were not available when the Authorized Version was translated. The American Standard Version. 1900–1901. This version incorporates into the text the readings preferred by the American members of the Revision Committee of 1881–1885.